A couple weeks ago, Joel and I hit the fields. 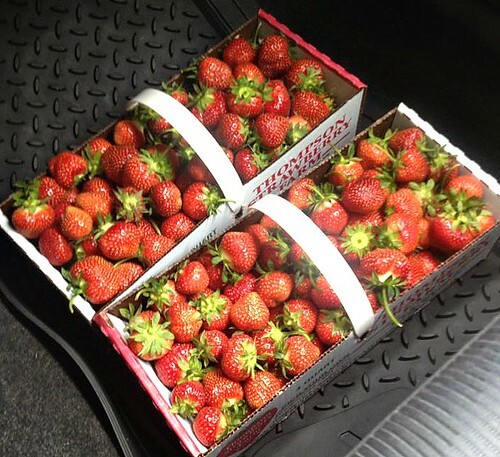 The strawberry fields! It's been an annual place we go the past several years and a great way to help Joel appreciate agriculture. This year we left with several pounds and I've been having fun finding ways to use them up. 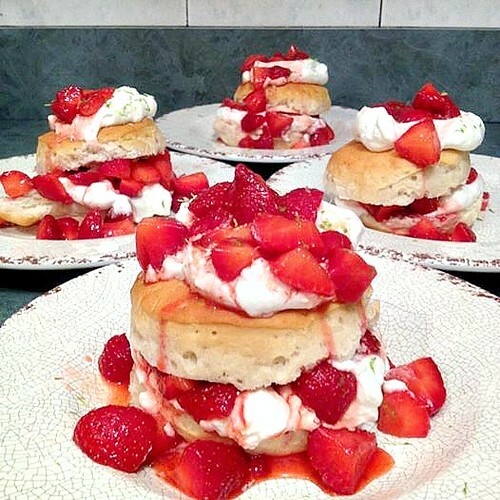 Most recently, I made these Strawberry Key Lime Shortcakes for a post July 4th dinner we hosted. They were delicious and with plump sweet strawberries layered between fluffy clouds of fresh whipped cream and key lime kissed biscuits, how could they not be?! In a medium bowl, combine the strawberries and sugar, tossing to coat and set aside. In a large bowl, combine flour, baking powder, and salt. Using a pastry blender, cut in butter until mixture resembles coarse meal. Chill 10 minutes. In a small bowl, whisk together heavy cream, honey, lime zest and lime juice until well blended. Add mixture to flour mixture; stirring until just combined. Turn dough out onto a lightly floured surface; knead lightly 4 times. Roll dough into a (1/2-inch-thick) 9 x 5–inch rectangle; dust top of dough with flour. Fold dough crosswise into thirds (as if folding a piece of paper to fit into an envelope). Re-roll dough into a (1/2-inch-thick) 9 x 5–inch rectangle; dust top of dough with flour. Fold dough crosswise into thirds; gently roll or pat to a 3/4-inch thickness. Cut dough with a 1 3/4-inch biscuit cutter to form 14 dough rounds. Place dough rounds, 1 inch apart, on a baking sheet lined with parchment paper. Bake at 400° for 12 minutes or until golden. Remove from pan and cool 2 minutes on wire racks. To assemble the shortcakes, split each biscuit in half cross-wise. Place bottom half on a serving dish. Top with a dollop of whipped cream, followed by a spoonful of strawberries. Place other biscuit half on top, followed by another dollop of whipped cream and another spoonful of strawberries. Repeat with the other remaining biscuits. Just before serving, garnish with more fresh lime zest, if desired. I also wanted to share a new toy in the kitchen that helped us groove as we made these Strawberry Key Lime Shortcakes! This DKnight Magicbox Ultra-Portable Wireless Bluetooth Speaker, is a must in our kitchen because it definitely sets a fun atmosphere in the kitchen whether we're cooking, baking, entertaining or just having dinner together as a family. 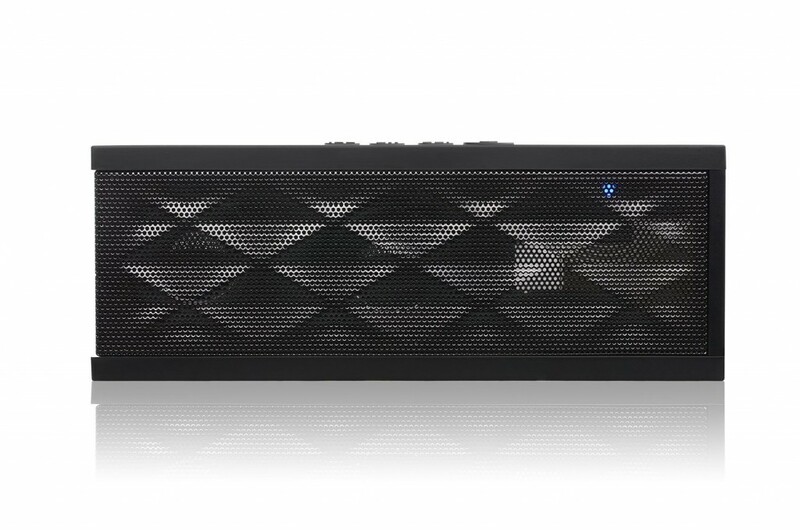 I wanted a dedicated stereo or radio in the kitchen for awhile now but after receiving the DKnight Magicbox, there really was no need for a radio/stereo because I could use this speaker throughout the house. This was a great product and I can't imagine not having one at home. It was easy to start using immediately from the box and the sound quality is fantastic. Sound is heard all around - not just from one side - so it can be heard from all angles regardless of where it's placed. I've used it both connected to my laptop for virtual meetings and also through my mobile phone in conjunction with a music app (my favorite is Songza!). The quality is excellent in both applications and the volume adjustment is great too with a large range. I have not taken a call through the speaker but I anticipate it would handle just as well. The best feature is being able to move the speaker to follow you so you're never too far from great music. I use it daily and when I entertain, it's fantastic to bring outdoors on the deck and then back inside when weather is cooler, all without the hassle of dealing with cords. I love this product and will definitely be purchasing more for the holidays to give to friends and family! I love the idea of combining lime with the strawberry shortcakes- looks great!